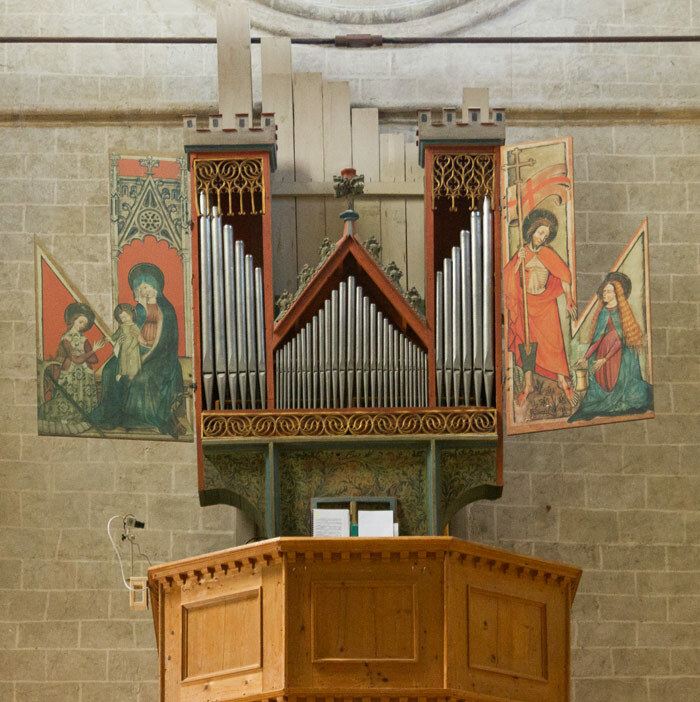 One of the world's oldest working organs is found in the Swiss church of Notre Dame de Valère, Sion (picture 1). The case and its painted doors have been reliably dated to about 1435. It thus comes from the last of the four centuries of Gothic building – the age of pointed arches, elaborate window tracery and soaring spires - which gave Europe its greatest cathedrals and churches. 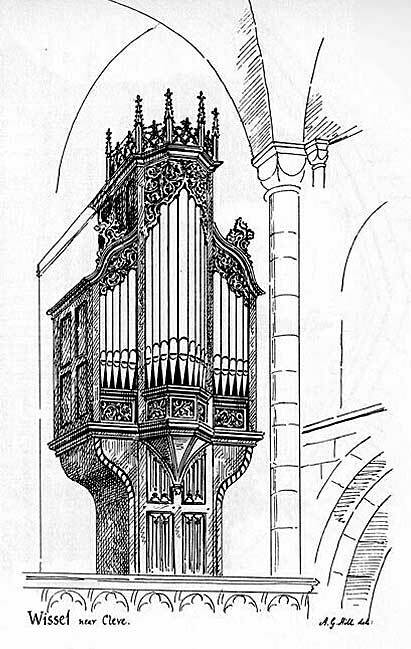 Many of these architectural features were adapted, on a suitably reduced scale, for use in organ cases. ​A reason for the change is suggested by the metal of the three remaining original stops, all belonging to the upper-work. This is of poor quality and large pipes made of such material would have been likely to collapse under their own weight. Such problems, perhaps recurring over many years, may well have prompted the replacement of seven stops in the 17th century when bass pipes were placed behind the case. Nevertheless, this is a most interesting survival, well worth a visit; but those who listen to it hear not the sounds of the 15th century but those of nearly 200 years later. Picture 2, one of the meticulous “on-site” drawings of Dr A.G. Hill, published in Victorian times, shows a different and rather later treatment of case towers. Here, in Palma, Majorca, towers and flats are surmounted by pyramids, another idea borrowed from church builders of an earlier age. Such terminations to church towers — sometimes conical rather than pyramidal — were not uncommon from the 12th and 13th centuries onward. They seem to have been used especially on buildings that had twin West-end towers, as at the cathedrals of Angoulême (France) and Tournai (Belgium). They are known as Rhenish caps, perhaps because of their resemblance to a form of head-covering once fashionable among women from that region. Crenellation, which would have been pointless, is rarely found on towers with this type of cap. So it is with the Palma case, which has a lighter form of decoration at the base of each pyramid. This is of a kind that paved the way for the cresting that appeared in later cases. One of the most elegant of surviving gothic cases is found at Wissell. 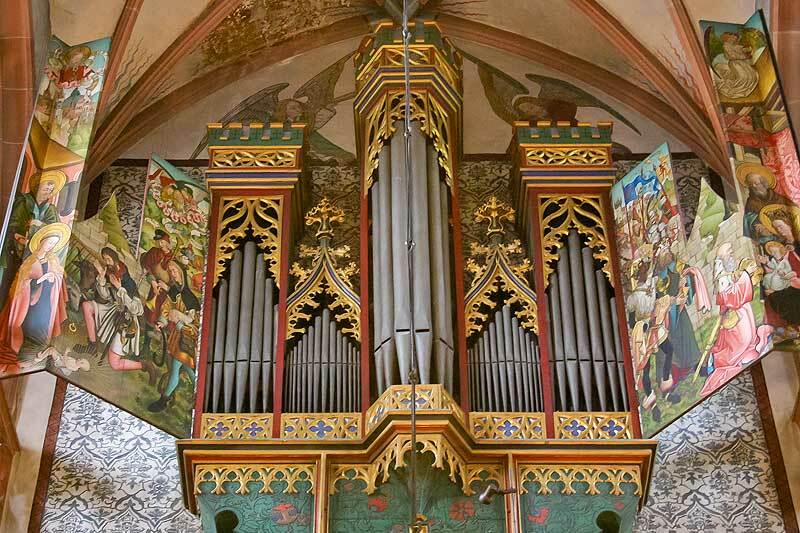 This town, now in the Netherlands, was part of an independent Duchy when the organ was built in 1490. Kleve — usually rendered Cleves in English — is nearby. It is possible, perhaps even probable, that a daughter of the Duke of Kleve, Anne, who was born 25 years after the organ was built, may have seen and heard it. She, it will be recalled, became the fourth wife of Henry VIII of England. The marriage lasted only six months and she came out of the encounter better than four of the other five wives. Not only did she retain her head and her freedom but she also received a generous settlement and was able to end her days living graciously at Hever Castle in Kent. This arrangement may have been a black joke by the unpleasant Henry; Hever had been the childhood home of his second wife, Anne Boleyn, who was beheaded. An aside: In the 20th century, this castle was leased by the American, William Waldorf Astor, whose wife restored and furnished it most beautifully. Much of her work remains and can be seen by visitors to the castle. The last case is that at Kiedrich, in Germany. It dates from 1510 — 65 years later than at Sion, which it resembles in many respects. This resemblance may well have been even more marked when Sion had its original pipes in the towers. The use of colour — especially red and green — and of gilding as in Kiedrich were very much the hallmarks of Gothic work. So, too, were the painted doors which were kept closed at solemn seasons of the church's year, such as Lent. These cases would soon be completely outmoded as the architecture of Greece and Rome ousted that of the Normans and the Goths. Fashions tend to go in cycles. 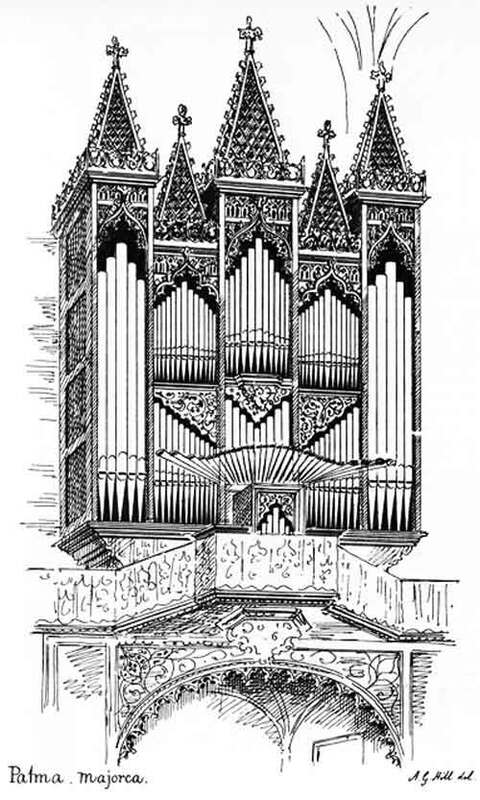 When interest in Gothic styles re-wakened in the 18th century, some rather improbable organ cases appeared. Fortunately, antiquarians like Dr Hill and Sir John Sutton appeared on the scene and some really memorable cases resulted from their research and writings. 1 and 4 - Jenny Setchell. 2 and 3: Dr A.G Hill: Organ Cases of the Middle Ages.